The Trading Central Indicator is an easy-to-install customizable indicator designed to help traders make informed decisions. The Trading Central Indicator allows users to see Trading Central’s strategies directly on the Trading Station Desktop’s charts and to fill in orders based on Trading Central levels. 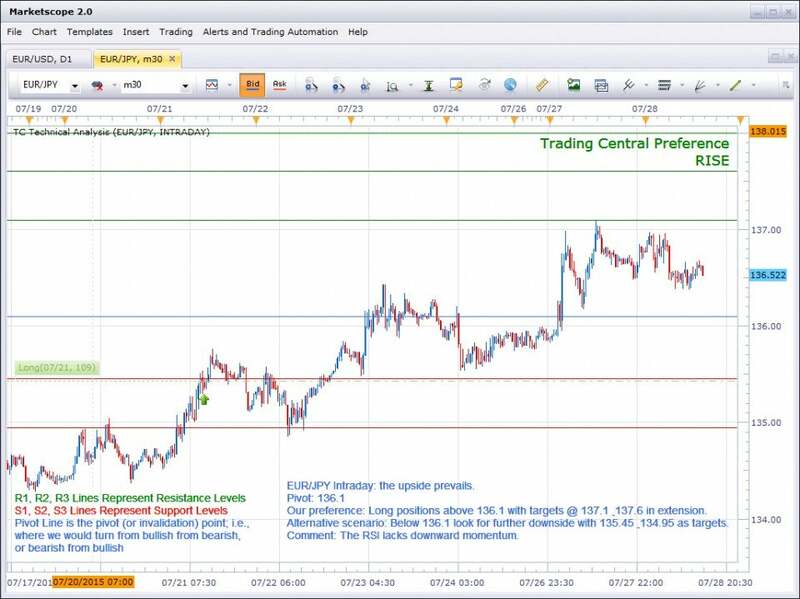 The Trading Central Indicator plug-in superimposes Trading Central’s technical analysis strategies, forecast, commentary and key levels (support / resistance / targets / stop pivots) onto the Trading Station’s Charts on most tradable instruments. Based on selected timeframes the Trading Central Indicator will display the latest Trading Central analysis whether on an intraday, short term or midterm basis. FXCM is an independent legal entity and is not affiliated with Trading Central. Trading Central is not owned, controlled, or operated by FXCM.